I study the evolutionary ecology of growth and development in variable environments. I am especially interested in whether macroecological and macroevolutionary patterns of organismal size, shape and function arise due to fundamental biomechanical constraints; or reflect the outcome of natural selection on life history traits such as behaviour, physiology, growth, development and survival. I perform lab-based, whole-organism ecophysiological experiments on American and European species of damselflies within a phylogenetic comparative framwork. I also take advantage of the rich natural history literature on damselflies and perform computer simulations of their life histories. By combining these approaches, I hope to understand the microevolutionary underpinnings of well known phenomena such as the size scaling of metabolism, the temperature-size rule and latitudinal and evolutionary trends in body size. 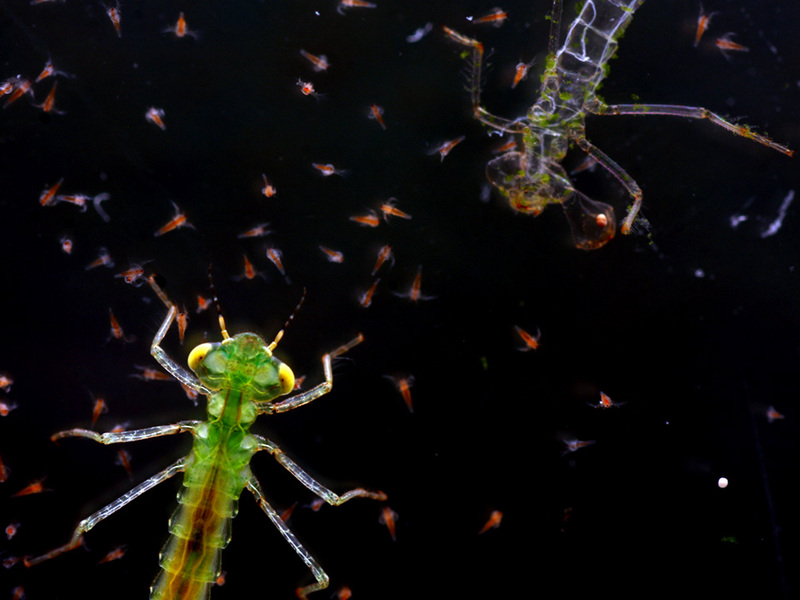 Final instar larva of Ischnura verticalis with its cast larval skin and Artemia salina prey. One of 25 damselfly species currently studied in the lab. Does metabolic scaling reflect biomechanical constraints or natural selection? What is the functional basis of variation in growth rate?